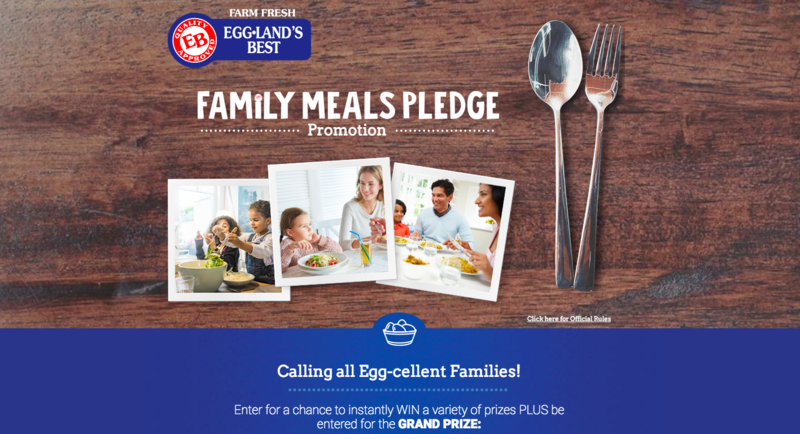 Concept: Eggland’s Best is encouraging families to sign its pledge for the chance to win big to spend more time together. Objectives: Boost awareness for National Family Meals Month, drive engagement and positive consumer sentiment with Eggland’s brand and products. Do you know the average family only spends 12 minutes together at the table during mealtime? In Eggland’s Best latest promotion they are trying to bring families back together, by offering a grand-prize of $5,000 towards a family vacation. As Eggland’s points out, research shows that family meals can greatly benefit the health and wellbeing of our children. In addition to the enviable prize a family could win towards a vacation, Eggland’s is also calling on families from across America to commit to spending an additional “dozen” minutes around the table while enjoying nutritious meals together. Eggland’s Best also included an Instant Win component to their promotion, for every one pledge entry, consumers will receive one entry into the Grand Prize Drawing, but as an added bonus, they will also have the chance to instantly win a variety of other prizes. The Wyng Instant Instant Win Use Case allows you to run a fully automated promotion where participants enter to win a prize and find out immediately if they've won. Who doesn’t love instant results!? 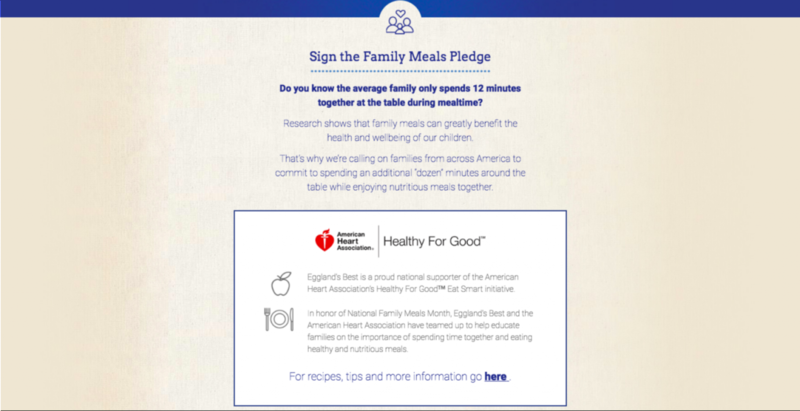 Along with the pledge and instant win prizes, in honor of National Family Meals Month, Eggland’s Best and the American Heart Association teamed up to help educate families on the importance of spending time together and eating healthy and nutritious meals. On their campaign microsite, they have also included links to recipes and tips families can use. Offer a relevant prize. Many loyalty programs offer their customers the same types of rewards: discounts, free shipping, and free products (to name a few). While appealing, catering your rewards menu to your fans will increase enthusiasm and participation by tapping into your consumers’ interests, which is exactly what Eggland’s Best did by offering a prize towards a family vacation. The prize felt relevant and was in-sync with their campaign’s messaging and purpose. Take advantage of improved components. The Wyng form components streamline the entry process and makes it even easier for consumers to participate, resulting in an increase in engagement. Tie your campaign to an important cause. Both giving and user generated content can be highly contagious. People are more likely to give a donation, sign a pledge or upload a selfie if they see someone they know doing it. Consider it positive peer pressure! Eggland’s Best took advantage of this to get their consumers to both sign a pledge and enter their Family Meals promotion for a good cause. Emotion is a basic human instinct and a powerful tool for encouraging campaign participation and sharing.